Supporting our students in their pathways to literacy is an ongoing effort that that requires us as educators to continuously evaluate our plans, instructional approaches, text selections, and more. To have the most effective and comprehensive literacy plan, it is imperative that we are continuously learning from our peers and incorporating the most current research. 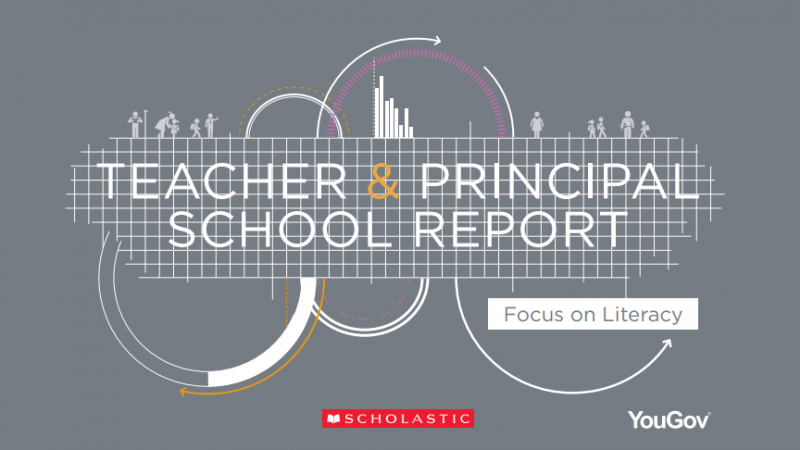 Today, I’m pleased to share with you newly released research from Scholastic based on the responses of more than 4,700 educators in the Teacher & Principal School Report: Focus on Literacy. The report explores the views of teachers and principals on the importance of reading, the state of independent reading in school, the home-to-school connection, and summer reading. Based on the findings, here are three main ideas I believe that every educator can consider and use to refine his or her literacy plans. Ninety-four percent of teachers and principals agree that students should have time during the school day to read a book of their choice independently. Yet, the research also shows us that even with a majority of teachers setting time aside for reading, only 36% do so every day. They also tell us that the number one barrier to this time is the demands of the curriculum don’t allow enough time. Educators who do make the time shared that they see increased student achievement and higher engagement of reading. The benefits of independent reading are so numerous, that even with these demands, educators must work together to incorporate the time into their days. Allowing for small group instruction during your literacy blocks is an excellent approach. By grouping students together and rotating them through stations as we recommend in our Guided Reading programs, teachers are able to provide independent reading time, one-on-one instruction, and even time for writing. Cross-curricular plans are also important to consider. It is a misconception that independent reading must only be in ELA courses. Science and social studies classes also offer opportunities for this time and with rich, relevant texts such as news articles. Access to books cannot be stressed enough in order to have an effective literacy plan to support your students. This is an issue that needs to be addressed as nearly half of educators say that access to books at home is NOT adequate for their students—69% in high-poverty schools. The overwhelming majority also told us in the report that they agree schools play an important role in expanding this access. I completely agree. To tackle the issue, start in your classroom and school libraries and then expand your thinking to include community partners. Nearly half of teachers can only update their classroom libraries once a year or less and a quarter of principals and school librarians say the same about school libraries. This helps explain why educators also told us they are in need of culturally relevant titles, recently published titles, multiple copies of popular titles, books in other languages, and more. To truly engage students in reading, they need to be able to find the right book for themselves to ignite that emotional spark that makes lifelong readers. We are not enabling that without a proper selection of titles within the schools that students can borrow as they please. Outside of our school walls, community organizations can be vital partners in expanding access to books at home, yet only 13% of principals report that they are engaging with the community in this way. This brings me to summer reading, which is the perfect time of year to engage with the community to make the home-to-school connection. Tackling the lack of access to books at home is never more critical than it is during the summer months, when students are most at risk of suffering a loss of academic skills. Sixty-four percent of educators shared with us that they personally encourage summer reading as a way to promote literacy overall—77% in elementary schools. Knowing that the summer slide is responsible for as much as 85% of the reading achievement gap between higher- and lower-income students, there is definitely room for more of us to be sending this message to our students and families. The research shows us that educators rely heavily on the local public library as a way for students to get books over the summer. Far fewer teachers and principals report they are able to personally, or as a school/district, provide books for students to take home. This brings us back to the issue of access and I urge us all to think creatively. About one in 10 educators told us they are implementing great strategies to provide books such as hosting literacy events, keeping the school library open and connecting with community partners. With these ideas in mind and knowledge around the use of Title I funds to support summer initiatives including take-home book pack distributions, it is possible to create a robust plan to support your students year-round. And if you think some motivation may do the trick, consider the free Scholastic Summer Reading Challenge where students can log their summer reading minutes online and earn rewards. The Teacher & Principal School Report: Focus on Literacy has a wealth of information on the current views of educators regarding the importance of reading. I encourage you to learn more about the data that inspired my three key takeaways and explore the entire report for inspiration of your own. You can download the full report and infographics at scholastic.com/teacherprincipalreport. There, you can also find the additional report, Teacher & Principal School Report: Equity in Education to learn about findings around barriers to learning, educators' funding priorities, family and community engagement, professional development, and more. Follow and join the conversation on social media at #TeacherPrincipalReport.